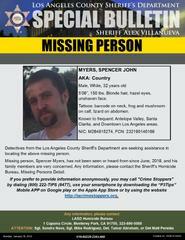 Detectives from Los Angeles County Sheriff’s Department Missing Persons Detail are seeking the public’s assistance in locating Spencer Myers, also known as "Country", a 32 year-old male, White, who has not been seen or heard from since June, 2018. 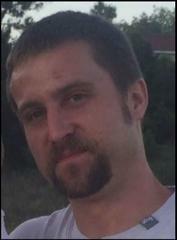 Mr. Myers is described as 5’06”, 150 lbs., blonde hair, hazel eyes, and an unshaven face. He has tattoos: a barcode on his neck; a frog and mushroom on his calf; and a lizard on his abdomen. Mr. Myers is known to frequent Antelope Valley, Santa Clarita, and Downtown Los Angeles areas. His family would really appreciate any information on his whereabouts.